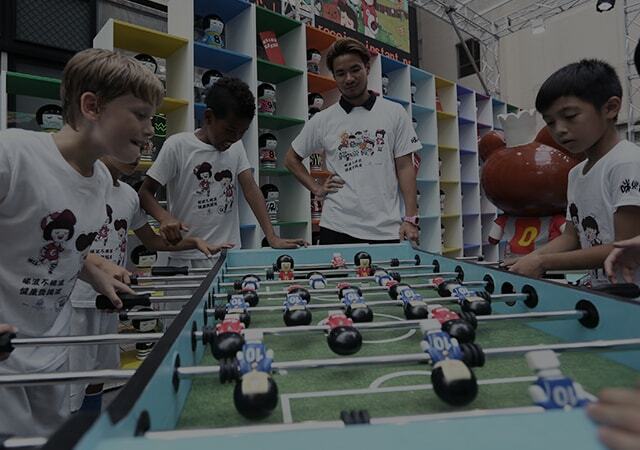 The largest-ever territory-wide promotional campaign was launched by Ping Wo Fund in the run-up to the World Cup 2014. Aimed at raising public awareness on the ills associated with excessive gambling, this joint effort with the Home Affairs Bureau and the Police comprised a wide array of district-level activities including a thematic roadshow featuring giant cartoon characters set in a football ground scene. There were also district carnivals with edutainment elements contributed by community groups, as well as citywide promotions through electronic and print media and social media, all of which were intended to instill in young people positive values towards football as a healthy sport in an animated manner. Thanks to the support from more than 70 community partners including social service organisations and schools, more than 100 activities were held and the number of direct participants in the campaign reached 290,000. Through Ping Wo Fund Sponsorship Scheme and Ping Wo Fund School Project Grants, myriad education initiatives have been organised by 140 community organisations and schools to disseminate messages on the prevention of problem gambling, reaching over four million participants. Meanwhile, Ping Wo Fund has since 2003 sponsored the production of docu-drama built on real-life experiences to promulgate the negative impact of problem gambling on the gamblers, their families and the community in general.